Actors are often slaves to authors, or at any rate authors are often dictatorial toward actors, but Angela Lansbury, 84, and Stephen Sondheim, 79, have had a rare theatrical relationship, in a way helping each other create, or reimagine, some of the landmark musicals of the past 45 years: the 1964 cult flop Anyone Can Whistle; the great revival of Gypsy in the seventies; Sweeney Todd in 1979; and the just-opened revival of A Little Night Music, directed by Trevor Nunn and co-starring Catherine Zeta-Jones. On the morning after the first preview, Sondheim and Lansbury—he weary from the previous night, she chipper and ready for rehearsal—sat down at Sardi’s to discuss their collaboration. It began when Arthur Laurents, who was directing Anyone Can Whistle, as well as writing its book, suggested casting Lansbury in a leading role, despite not knowing if she could sing. 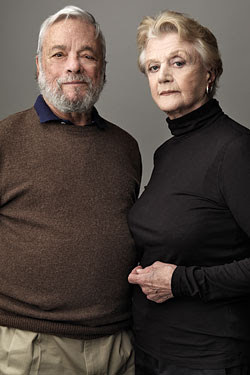 Read more: Side by Side - Stephen Sondheim and Angela Lansbury on a lifetime of theater.